HonestReporting.com invites Congresswoman Ilhan #Omar, a ‘religious’ Muslim, following her series of mostly very antisemitic comments, to #Israel “to join our Mission to Israel to see the country for herself”. Generous, open hearted, a response to be proud of. Will U S ‘Democratic Party Congresswoman Ilhan Omar accept? This painting was made after my first visit to Israel back in the early 1980’s so now has growing historic value. The painting reminds us that Israel was laid waste following the Arab Islamic invasion some 1400 years before I arrived. The desolation is clearly shown in the collection painted by the Scots artist David Roberts RA (24 October 1796 – 25 November 1864). Mark Twain wrote “I could ride for 10 miles in any direction and not meet a single living soul“. After centuries of neglect, today Israel is once again a vibrant and growing country. 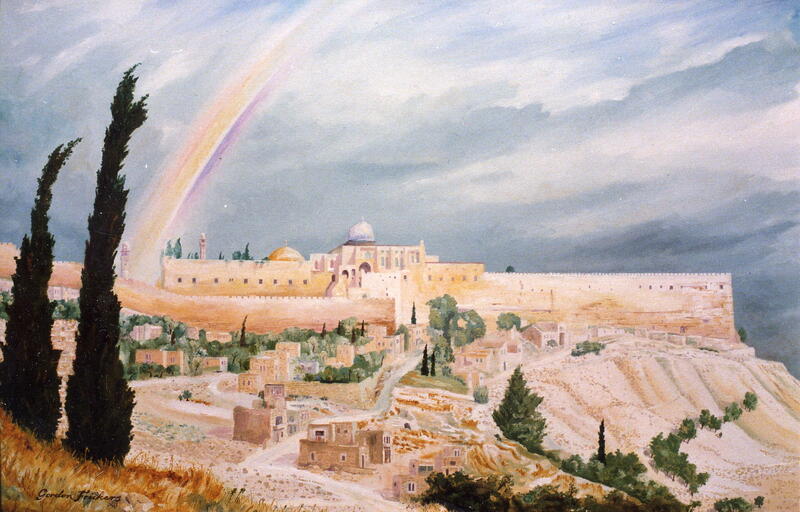 This rare painting measures 61 x 91 cm (24″ x 36″), available, £4,000, see page: Jerusalem, Temple Mount, David’s city.